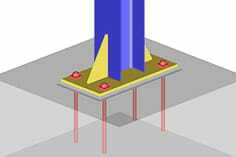 Do you have a program for the design of concrete-supported columns? It is not about the design of the quiver, but about required embedment depth, existing concrete tension, proof of the shear stress in the support etc .. The add-on module JOINTS Stahl Stützfuß offers this type for selection and dimensioning. Further information can also be found on the corresponding product page of our website.